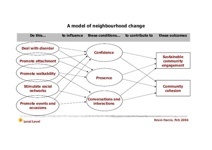 Kevin Harris has come up with a rather good model of neighbourhood change that ties in neatly with our recent discussions about Governance with the grain. Kevin's prescription comes down to more conversations and less committees, leading to stronger networks and, well, neighbourliness. It's obvious that neighbourhood governance makes huge assumptions about people's readiness to commit to community action. But I've stood in community centres watching people come in to find out what's happening and see who can help them; and I know they will sense and avoid any situation where they might be pinned to the wall and coerced into being treasurer of this or that committee for the next four years. If your everyday life is a complex muddle of errant kids and dodgy health, malevolent housing conditions and unpredictable income, you're probably not up for a 24 month committee commitment. If you can see how it relates to your problems though, you might be up for collectively organising something where you can see a beginning and an end. Is that obvious? Good. 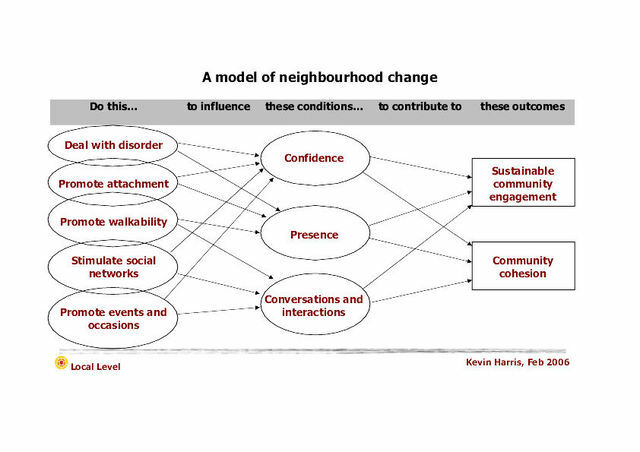 What Kevin suggests, as shown in his diagram (click to enlarge), are actions that will help build people's confidence, increase the use of public places in ways that work for all, and more social interactions. I think there are actions we can focus on to influence those conditions: dealing with disorder, promoting attachment, promoting walkability, stimulating social networks, and organising events and occasions - and maybe some others that I haven't thought of yet. Again, policy hasn't come up with this sort of list - disorder certainly, walkability occasionally, and organising events sometimes at local level. But what would policy look like if it sought to promote attachment to place (eg by addressing high levels of geographic mobility) and helped to stimulate social networks and encourage more conversations? It does seem to me that certain outcomes are likely if we use these influences on the specified conditions. Boosting what I've called community confidence, local presence, and the frequency of conversations between residents will have a positive effect, I would argue, on getting sustainable community engagement (which of course has to be a rich mix of participatory opportunities, not a string of committees) and on community cohesion. Put like that, it all seems blindingly obvious, but it isn't the sort of thing that you see in the action plans. It is difficult to chunk up into projects that can be neatly budgetted and tendered to consultants. It involves local groups and agencies giving a lead in the ways that they relate to local people, and to each other with a strong emphasis on openness, accessibility, delivery.... getting out there and living it, not just attending yet more meetings to talk about it. I know many groups and agencies are good at that ... but quite a few aren't. From what I've heard of Castle Vale they may be just the people to show how to do things a bit differently. Kevin and I have been invited over to talk some more, and I'm looking forward to that. The aim of the programme of events in the Action Plan is in part economic, to draw people in and improve spending, but it is also aimed at making the town centre more 'family friendly' in the evenings. We are also intending to hold a series of what we originally called workshops, but which may yet morph into something like the NEF 'People's Cafes' - "more conversation, less committees." I hope to post more when the details are clearer.